Former Argentine President Cristina Fernandez de Kirchner has been charged over corruption allegations. A federal judge approved charges of illicit association and fraudulent administration against Ms Fernandez. Judge Julian Ercolini also ordered the freezing of $633m (£516m) of Ms Fernandez's assets. She has previously denied any wrongdoing. It is alleged that her government steered public contracts to a businessman close to her family. Ms Fernandez has said the case is politically motivated and accused current President Mauricio Macri of plotting against her. "Illicit association is a legal concept that has been used by all dictatorships to persecute their political opponents," she tweeted. In a court appearance in October, Ms Fernandez presented national budget documents as part of her evidence, highlighting that the accounts had been approved by parliamentary bodies and the country's auditor general. Judge Ercolini also approved corruption charges against two of Ms Fernandez's former aides, ex-planning minister Julio de Vido and former public works Secretary Jose Lopez, as well as businessman Lazaro Baez. Ms Fernandez is accused of favouring Mr Baez's construction company, Austral, in the concession of contracts for public projects. The company was granted more than 50 contracts for public projects during her two terms in office, Clarin newspaper reported. In June, Mr Lopez was caught throwing bags filled with almost $9m (£7.3m) over the walls of a monastery, and was arrested on suspicion of money laundering. Ms Fernandez served two terms from 2007 to December 2015. 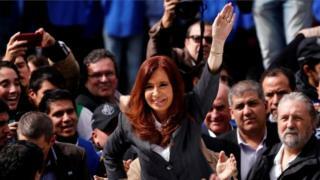 She succeeded her husband, the late Nestor Kirchner, who was in power from 2003 to 2007. She is one of the main leaders of the opposition to the centre-right government of Mr Macri.